Fined: Maryanne Hemsley (inset) and the protesters outside Newcastle Local Court. 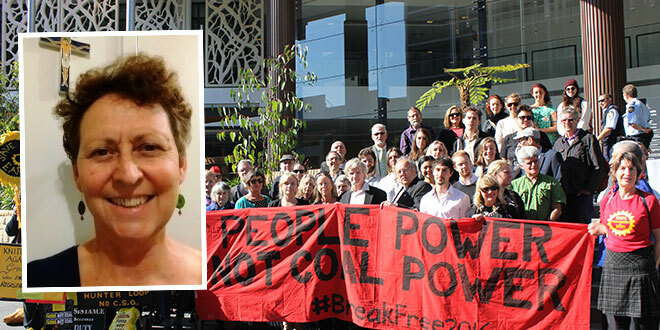 SYDNEY Catholic Maryanne Hemsley said her arrest and conviction for standing up against using coal and other fossil fuels was “a matter of faith”. “It isn’t only up to young people to demand a better response to climate change, it is up to all of us,” Mrs Hemsley, parish secretary of St Joseph’s Church, Enfield, said. Mrs Hemsley was one of 66 protesters arrested on May 8, as they blockaded the main railway bridge into Newcastle’s coal port, the biggest coal port in the world. In the same protest action about 400 people blocked the entrance of the Newcastle port in a flotilla of kayaks, and thousands more rallied on a beach. Earlier this month, Mrs Hemsley faced Newcastle Local Court, was convicted of a rail trespass charge and was fined $300. Others convicted and fined included an Anglican minister and grandmother from Canberra, and an academic from Monash University. “As a Catholic, I hold very dear ideals and ideas expressed in the Pope’s encyclical Laudato Si’, on integral ecology, love and care for the poor,” Mrs Hemsley said. “Included in the poor is our precious Earth, our Common Home, which we have treated so badly. Mrs Hemsley said Australian governments were “doing almost nothing”. “Australia has agreed to the (United Nations) Paris agreement to keep global warming below 1.5 degrees,” she said. Mrs Hemsley also called on the Federal Government to protect the Great Barrier Reef by stopping Adani’s proposed $16 billion Carmichael coalmine, rail and port development in Central Queensland. The Federal Government approved the project in 2014, but approval was set aside by the Federal Court, because then Federal Environment Minister Greg Hunt had not properly considered advice about two vulnerable reptile species.